Definitive British stamps went through another transition, beginning in 1952. 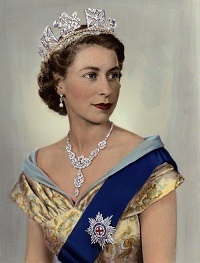 On February 6, 1952, King George VI died, and the Heiress Presumptive, Princess Elizabeth Alexandra Mary, ascended to the throne as Queen Elizabeth II. The new definitive postage stamp designs for Queen Elizabeth II were very simple, yet elegant and beautiful. These issues are referred to by philatelists at the "Wilding Issues". All of the definitive postage stamps of this design, issued between 1952 and 1968, are photogravure and perforated 14 1/2 x 14. This time period also includes the issue of four high-denomination pictorial definitive postage stamps. There are three major catalog groups of these, issued between 1955 and 1968. These high-denomination stamps are all engraved and perforated 11 x 12. The major catalog groups of the Wilding designs and of the pictorial definitive designs, issued between 1952 and 1968, all have the same identical appearance. Providing all the stamp images for each of these catalog groups would be highly redundant, and the webpage would severely impact the operational capability of even the best of computer systems / web browsers. For that reason, the images of the various denominations of the Wilding Issues and the high-denomination pictorial definitives will only be shown once. A brief description, along with a catalog listing table, will be provided for each of the catalog groups in this category. All of the eighteen denominations of the Wilding Issue of definitive British stamps are shown above. The first group of Wilding design definitive postage stamps were issued between 1952 and 1953. These stamps are all printed on paper with WMK 298 - the Tudor Crown and "E 2 R" Multiple watermark. 1/2 P. (1953 - Sc. #292) - Red Orange. 1 P. (1953 - Sc. #293) - Ultramarine. 1 1/2 P. (1952 - Sc. #294) - Green. 2 P. (1953 - Sc. #295) - Red Brown. 2 1/2 P. (1952 - Sc. #296) - Scarlet. 3 P. (1952 - Sc. #297) - Dark Purple. 4 P. (1953 - Sc. #298) - Ultramarine. 5 P. (1953 - Sc. #299) - Light Brown. 6 P. (1952 - Sc. #300) - Lilac Rose. 7 P. (1952 - Sc. #301) - Emerald. 8 P. (1953 - Sc. #302) - Bright Rose. 9 P. (1952 - Sc. #303) - Deep Olive Green. 10 P. (1952 - Sc. #304) - Royal Blue. 11 P. (1952 - Sc. #305) - Violet Brown. 1 S. (1953 - Sc. #306) - Brown. 1 S. 3 P. (1953 - Sc. #307) - Dark Green. 1 S. 6 P. (1953 - Sc. #308) - Dark Blue. The 1 1/2 P., 2 P., and 2 1/2 P. denominations, watermarked sideways, are from coils. The 1/2 P. through the 2 1/2 P. denominations, with inverted watermarks, are from booklet panes. The four pictorial high-denomination definitive British stamps shown above were issued during 1955. These stamps were printed on paper with WMK 308 -- the St. Edward's Crown and "E 2 R" Multiple watermark. Each of these British stamps features the portrait of Queen Elizabeth and a "window" showing a famous British landmark. The Scott catalog attributes and designs are as follows. 2 S. 6 P. (1955 - Sc. #309) - Carrickfergus Castle (12th Century), Northern Ireland. 5 S. (1955 - Sc. #310) - Caernarfon Castle (13th Century), Wales. 10 S. (1955 - Sc. #311) - Edinburgh Castle (12th Century), Scotland. £ 1 (1955 - Sc. #312) - Windsor Castle (11th Century), England. This second group of Wilding design definitive postage stamps were issued between 1955 and 1957. These British stamps are all printed on paper with WMK 308 -- the St. Edward's Crown and "E 2 R" Multiple watermark. 1/2 P. (1956 - Sc. #317) - Red Orange. 1 P. (1956 - Sc. #318) - Ultramarine. 1 1/2 P. (1956 - Sc. #319) - Green. 2 P. (1956 - Sc. #320) - Red Brown. 2 1/2 P. (1956 - Sc. #321) - Scarlet. 3 P. (1956 - Sc. #322) - Dark Purple. 4 P. (1955 - Sc. #323) - Ultramarine. 5 P. (1956 - Sc. #324) - Light Brown. 6 P. (1956 - Sc. #325) - Lilac Rose. 7 P. (1955 - Sc. #326) - Emerald. 8 P. (1956 - Sc. #327) - Bright Rose. 9 P. (1956 - Sc. #328) - Deep Olive Green. 10 P. (1956 - Sc. #329) - Royal Blue. 11 P. (1955 - Sc. #330) - Violet Brown. 1 S. (1955 - Sc. #331) - Brown. 1 S. 3 P. (1956 - Sc. #332) - Dark Green. 1 S. 6 P. (1955 - Sc. #333) - Dark Blue. The 1 1/2 P., through the 3 P. denominations, watermarked sideways, are from coils. The 1/2 P. through the 3. denominations, with inverted watermarks, are from booklet panes. In 1957, experimentation began with electronic mail sorting machines. This required adding vertical graphite lines to the backs of some of the current Wilding stamps with WMK 308. 1/2 P. (1957 - Sc. #317c) - Red Orange. 1 P. (1957 - Sc. #318d) - Ultramarine. 1 1/2 P. (1957 - Sc. #319d) - Green. 2 P. (1957 - Sc. #320c) - Red Brown. 2 1/2 P. (1957 - Sc. #321c) - Scarlet. 3 P. (1957 - Sc. #322d) - Dark Purple. The 2 P. denomination has one graphite line. The other denominations have two lines. In 1959, some of the 1/2 P. through the 2 P. denomination stamps also had phosphor bars applied to the front of the stamps. This new group of Wilding design definitive postage stamps were issued between 1958 and 1965. These British stamps are all printed on paper with WMK 322 -- the St. Edward's Crown Multiple watermark. 1/2 P. (1958 - Sc. #353) - Red Orange. 1 P. (1959 - Sc. #354) - Ultramarine. 1 1/2 P. (1958 - Sc. #355) - Green. 2 P. (1958 - Sc. #356) - Red Brown. 2 1/2 P. (1959 - Sc. #357) - Scarlet. 3 P. (1958 - Sc. #358) - Dark Purple. 4 P. (1958 - Sc. #359) - Ultramarine. 5 P. (1958 - Sc. #361) - Light Brown. 6 P. (1959 - Sc. #362) - Lilac Rose. 7 P. (1958 - Sc. #363) - Emerald. 8 P. (1960 - Sc. #364) - Bright Rose. 9 P. (1959 - Sc. #365) - Deep Olive Green. 10 P. (1958 - Sc. #366) - Royal Blue. 1 S. (1958 - Sc. #367) - Brown. 1 S. 3 P. (1959 - Sc. #368) - Dark Green. 1 S. 6 P. (1958 - Sc. #369) - Dark Blue. Coil stamps have sideways watermarks, but booklet stamps come with upright, sideways, AND inverted watermarks, as well. The pictorial high-denomination definitive British stamps were re-issued during 1959. These re-issued stamps were printed on paper with WMK 322 -- the St. Edward's Crown Multiple watermark. The Scott catalog attributes and descriptions are as follows. 2 S. 6 P. (1959 - Sc. #371) - Carrickfergus Castle (12th Century), Northern Ireland. 5 S. (1959 - Sc. #372) - Caernarfon Castle (13th Century), Wales. 10 S. (1959 - Sc. #373) - Edinburgh Castle (12th Century), Scotland. £ 1 (1959 - Sc. #374) - Windsor Castle (11th Century), England. Again in 1958, continuing automated mail processing experimentation required adding vertical graphite lines to the backs of some of the current Wilding stamps with WMK 322. 1/2 P. (1959 - Sc. #353c) - Red Orange. 1 P. (1958 - Sc. #354c) - Ultramarine. 1 1/2 P. (1959 - Sc. #355c) - Green. 2 P. (1958 - Sc. #356c) - Red Brown. 2 1/2 P. (1959 - Sc. #357d) - Scarlet. 3 P. (1958 - Sc. #358c) - Dark Purple. 4 P. (1959 - Sc. #359a) - Ultramarine. 4 1/2 P. (1959 - Sc. #360a) - Henna Brown. These British stamps were issued both in booklets and in coils. Some of the booklet panes of these issues are VERY expensive.. In 1959, some of the 2 1/2 P. through the 4 1/2 P. denomination stamps also had phosphor bars applied to the front of the stamps. Beginning in 1960, all definitive British stamps, up to the 1 S. 6 P. denomination, were overprinted with vertical phosphor bands. This last group of Wilding design definitive British stamps was also printed on paper with WMK 322 -- the St. Edward's Crown Multiple watermark. 1/2 P. (1960 - Sc. #353p) - Red Orange. 1 P. (1960 - Sc. #354p) - Ultramarine. 1 1/2 P. (1960 - Sc. #355p) - Green. 2 P. (1960 - Sc. #356p) - Red Brown. 2 1/2 P. (1961 - Sc. #357p) - Scarlet. 3 P. (1960 - Sc. #358p) - Dark Purple. 4 P. (1960 - Sc. #359p) - Ultramarine. 5 P. (1967 - Sc. #361p) - Light Brown. 6 P. (1960 - Sc. #362p) - Lilac Rose. 7 P. (1967 - Sc. #363p) - Emerald. 8 P. (1967 - Sc. #364p) - Bright Rose. 9 P. (1967 - Sc. #365p) - Deep Olive Green. 10 P. (1967 - Sc. #366p) - Royal Blue. 1 S. (1967 - Sc. #367p) - Brown. 1 S. 3 P. (1960 - Sc. #368p) - Dark Green. 1 S. 6 P. (1966 - Sc. #369p) - Dark Blue. There are many watermark orientation and phosphor bar placement varieties. See the Stanley Gibbons Great Britain Specialised Catalogue for details. The pictorial high-denomination definitive British stamps were re-issued again in 1967 and 1968. These stamps are printed on unwatermarked paper. 2 S. 6 P. (1968 - Sc. #525) - Carrickfergus Castle (12th Century), Northern Ireland. 5 S. (1968 - Sc. #526) - Caernarfon Castle (13th Century), Wales. 10 S. (1968 - Sc. #527) - Edinburgh Castle (12th Century), Scotland. 1 £ (1967 - Sc. #528) - Windsor Castle (11th Century), England. Dorothy Wilding (1893-1976) was an English "society" photographer, having begun her photographic work at the age of sixteen. She became World-renowned for her photographs of numerous celebrities during the 1920's and 1930's, and she established studios in both the United States and the United Kingdom. 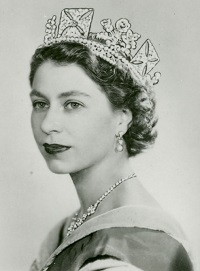 She photographed King George VI and Queen Elizabeth at their coronation, and her photographs were used in the design of the 1937 Coronation Commemorative stamps. In 1937, Dorothy Wilding became the first woman ever to receive a Royal Warrant, making her the official photographer for the Royal Family. 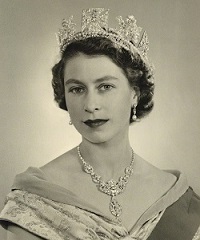 A large number of photographs of the 25 year old Queen Elizabeth II were taken during a sitting on February 26, 1952, just 20 days after the young Queen's accession. These photographs became the basis for the designs of the new definitive postage stamps, now referred to as the Wilding Issues.